There’s something that doesn’t just seem quite right about stuffing a dead cat and turning it into a remote-controlled flying helicopter. Dutch artist Bart Jansen has done just that and debuted his creation, the “Orvillecopter”, at the KunstRai ArtFair in Amsterdam at the weekend. Jansen describes the “Orvillecopter” – so named because the cat used was called Orville – as “half cat, half machine”. Orville had belonged to Jansen and died after he was hit by a car. “After a period of mourning, he received his propellers posthumously,” Jansen said. 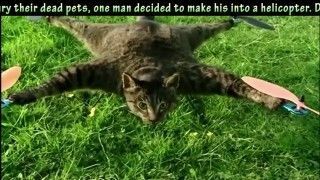 A video posted to YouTube shows the flying feline slowly hover a few meters in the air in a park, it’s body permanently spread eagle with propellers on its front paws. The “Orvillecopter” doesn’t fly quite right, however, a glitch Jansen hopes to fix. A fake comercial by the french humorists Les Nuls featuring cats smoking weed. 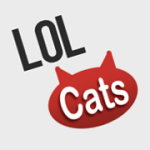 By CCC : Comité Contre les Chats.